Gallbladder issues?!? Not food poisoning? I’ve been having an upset stomach over the last 7 months. Looking back, it was fairly regular, with me getting sick every 3 or 4 weeks. But each time, I would explain it away: overdid it at Christmas, food poisoning, new allergies? But then I started to feel really unlucky with multiple food poisonings when those around me were fine; I’d doubled my hand washing but was still getting sick. The latest ‘attack of food poisoning’ was well-timed with a doctor’s appointment and I was surprised to find out that she suspected pancreatitis or cholecystitis (inflamed gallbladder). I ended up having my gallbladder removed and already feel much better. I didn’t attribute many of my symptoms to this little organ so I thought I’d share my experience so others might figure it out earlier. What is the gallbladder? Why does it get inflamed? The gallbladder collects, concentrates, and stores bile from the liver. When you eat foods with fats, bile is released into the duodenum to emulsify fats and help with digestion and absorption. 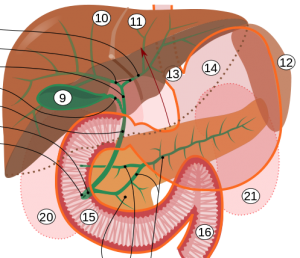 In the diagram on the right, you can see the position of the gallbladder (green #9) in relation to other organs of the biliary system. It sits under the liver (#10 and 11). Note: diagram edited from original for simplicity. The gallbladder is small, only about 4 cm by 8 cm (1.6 in by 3.1 cm) when full. So it shouldn’t cause too much trouble when it is angry, right? Uh, no. 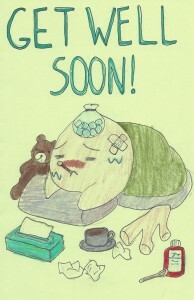 You can see lots of things on the interwebz about gallbladder attacks. The most common reason for cholecystitis (inflamed gallbladder) is gallstones. Of course, most people who have gallstones don’t have any symptoms and find out about the stones during a scan for something else. Vomiting – violent, until nothing left (dry heaves). In the last episode, I was unable to eat or drink anything without immediately vomiting. I thought I had food poisoning or was reacting to certain foods. I was reacting but not with an allergy but probably overloading my fat contents. I had put this down to getting older or having celiac disease. Shoulder pain – constant, low level pain in my mid-right shoulder. It sometimes became sharper. This disappeared after my gallbladder was removed. I thought it was from poor posture during computer work and kept getting a massage that didn’t work. Heartburn – only around the vomiting attacks. It was very severe (preventing sleep) and no antacids helped. Again, I just thought I was getting older and would have to deal with it. Pain in upper right ‘stomach’ – just under my ribs. During this last attack, I was told that I was positive for Murphy’s sign, Basically, a doctor pushes just under your ribs on the right side and asks you to take a deep breath. If you can’t do it – or try to hit your doctor – it is positive. And it is a sharp pain! I thought I was doing more ab work and slightly strained something. Yellow – on the last attack, I had a bit of jaundice according to my husband and other family. By then, I was hospitalized so I didn’t bother coming up with an explanation. I was diagnosed with cholecystitis and recommended to remove my gallbladder. I will go over my hospital experience in another post. Basically, surgeons used laparoscopic surgery to take out my gallbladder. There were 4 incisions: two for instruments including cameras, one for cutting and draining, and one at the belly button where the gallbladder is pulled out (as explained to me by the hospital doctors). I’m not sharing photos of my belly but the Wikipedia photo is on the right. What now? Do we need our gallbladder? For the first month, I was told to stay away from fat until my body adjusts. I no longer have a storage tank for bile so it constantly drips out of the liver. More importantly, it isn’t concentrated and released at the right time to help digest fats. @genegeek No fatty foods. Think of what rabbits eat. I’m hoping to be part of the 75% of people who have no long term side effects and forget that they ever had the surgery. However, a diet in limited fats seems healthier and I’m OK if I need to stay careful about what I eat. I hope you are feeling better, I was less lucky with doctors, 2 fobbed me off saying it was all in my head, then it ruptured and my system became septic… I can eat anything now (3 weeks since the operation), I hope you are feeling great now. Very good explanation – easy to understand! For your sake, I hope you’re one of the 75%, too!